Although the club officially opened in 1926, it was five years earlier that Henry Barran began to lay out a course, originally of six holes, four to the south of Alwoodley Lane. The major influence in the creation of the course was Yorkshire born Dr. Alister Mackenzie, who chaired the first AGM on March 7th, 1925. He had previously designed the other two major golf courses in the area. The club opened on March 20th 1926. Members were invited to buy a debenture to finance the construction of the original clubhouse, which was then situated close to where Moortown’s clubhouse is currently located .The number subscribing to debentures is probably revealed at the first Ordinary Annual General Meeting held at the Clubhouse on February 26th, 1927, when the membership figures included 77 Gentlemen and 14 Lady “Debenture Holders”. Initially Lady Members were not allowed to take up debenture shares, but following representations made at a Ladies’ Section meeting, Council agreed “that Lady Members be permitted to take up Debentures, and have the same privileges as gentlemen "
It had been agreed, in December, 1925, that the first 350 members, including ladies, should be admitted without the payment of an entrance fee. The total membership of 597 in February, 1927, also included 250 other gentlemen, 198 other ladies, 33 junior boys, 14 junior girls and 11 country members. By July, 1927, the membership had risen to 643. This figure was reported at a Council meeting on July 1st, 1927, and it led to a suggestion that Directors should consider limiting the membership “so far as is compatible with a sound financial position.” 2,034 visitors’ tickets had also been sold in the preceding six months and this was soon to lead to a ruling that, at the weekends, members and visitors would tee off alternately, irrespective of the time of arrival on the tee. Obviously no pre-booking system! At that time Alwoodley Old Hall stood in the centre of the course and served as a home to the greenkeepers' and their families. The successful establishment of the Club enabled it to take off in the ensuing decade on both the playing front and the expansion of facilities. This was despite the fact that the Great Slump, which began on “Black Friday”, 1929, and which caused very serious unemployment and the decline of many businesses, inevitably bit into the fortunes of leisure activities. At that time golf balls could be bought for 3d. or if Dunlops, Bromfords, etc, 4d, 6d and 9d at Feldman’s in North Street and Meanwood Road. Hardy’s in Boar Lane had woods from 5/- (hickory shafted drivers, brassies and spoons) to 18s. 6d (Propellor with selected flexible steel shafts), and a similar range of prices for irons and putters, many with hickory shafts. The growing popularity of the Club and course was reflected in the 1959 income from green fees which passed £1000 for the first time. In the 1960s the next phase of the Club’s development took place with the relocation to the north side of Alwoodley Lane, the purchase of more land and the building of the current Clubhouse. In 1967 the programme was well underway and the newly designed course covered 110 acres and measured 6529 yards. Alwoodley Old Hall, which was still inhabited had become structurally unsound, was on a list of Ancient Monuments and permission had to sought from the Corporation to demolish it. The land housing 14 holes had been bought for £15000 and to finance this subscriptions were raised to £35 for men and £20 for women members in 1969. In 1971 the Club leased additional ground to house 4 additional holes. The latest phase of the club house development is almost complete. Major refurbishment and decoration of the clubhouse was completed in 2015.The practice ground has been upgraded and now has a teaching studio and two covered bays. 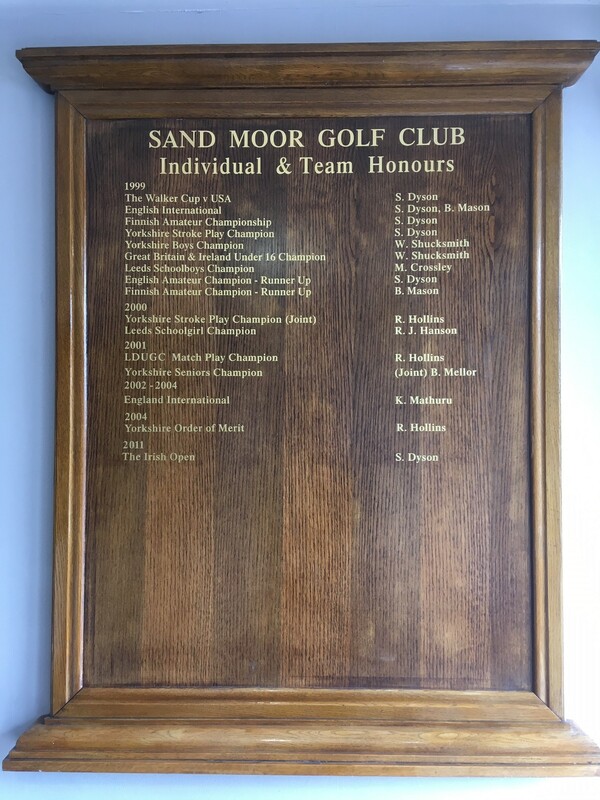 The improvements to the course under the direction of Andy Watson Golf design are being implemented over winter months and continue to ensure that Sand Moor is in the top league of golf courses anywhere in the country. 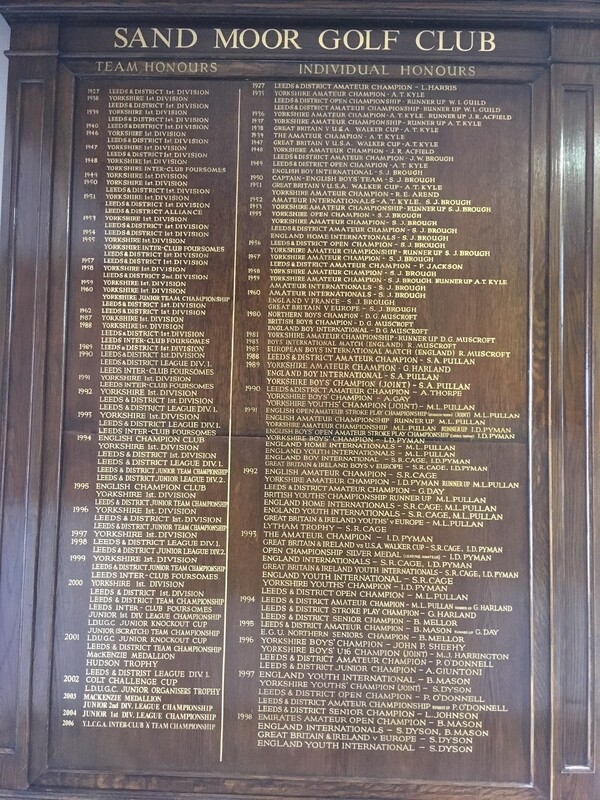 The Club has a proud history of playing achievements including Walker Cup representatives and regional and national champions as shown on the impressive honours boards displayed in the Clubhouse shown on the links below.